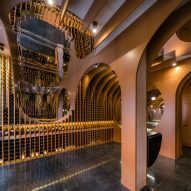 Architectural elements based on wine bottles and barrels create a contemporary vaulted ceiling in this wine shop in Valladolid, northwest Spain by Zooco Estudio. 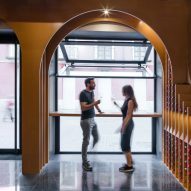 Called Vinas & Viandas, the cave-like wine shop occupies a 35-square-metre space with a shopfront that opens onto a paved street in the city centre. 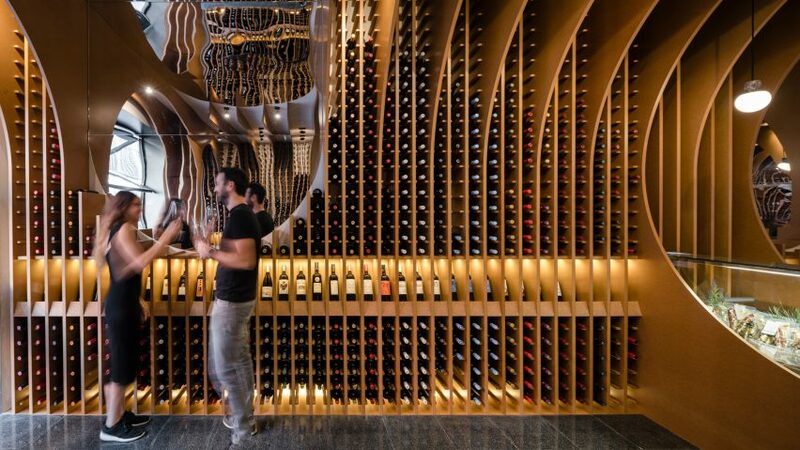 Inside, wine racks line either side of the space surrounded by curving architectural elements and furniture that are designed to recall the shape of wine bottles, barrels and the vaulted ceilings of old wine cellars. 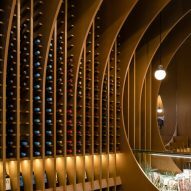 A series of timber panels cut with arches and large circular openings are installed at regular intervals across the length of the space. 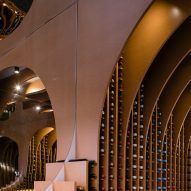 As well as evoking the vaulted ceilings found in "ancient underground cellars", the panels form archways and windows that divide the interior and outline the store's various zones, such as the counter, tasting table and exhibition-sale space. 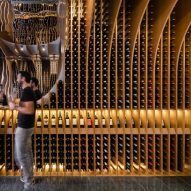 "The circumference shape is very noticeable in the world of wine," explained the Madrid- and Santander-based studio. 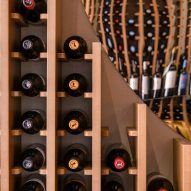 "It can be seen in the wooden barrels that are visible inside the cellars, in the bottles, and in the antique vaulted cellars. Therefore, the circumference introduces us into this world as the leitmotiv of the project." "The space is perceived as a sequence of wooden ribs in which the circumference shape is even more present," continued the studio. While the designers cut the panels from wood, they elected to install a stone floor reminiscent of those found in antique cellars. 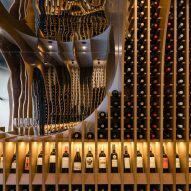 An oval mirror panel that mimics the curved shape of the archways climbs one of the walls and stretches over the ceiling in the tasting room creating warped reflections of the surrounding wine racks. Another circular mirror, that appears like another cut-out opening, sits behind the counter doubling the length of the space in its reflection. "The mirror material amplifies the atmospheric world of reflections where those circumferences seem to contain some kind of liquid," said the designers. 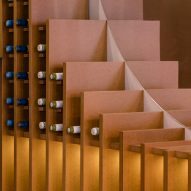 Spinning the wine bottle-shaped shutters in the windows of this Prague shop by Aulík Fišer Architekti reveals a wall of wine racks inside, while the interior of this Zurich wine store by Swiss architects OOS is built from crates used to transport the bottles. Photography is by Imagen Subliminal.